This apartment consists of the back half of a century old home that has been completely restored and newly furnished. 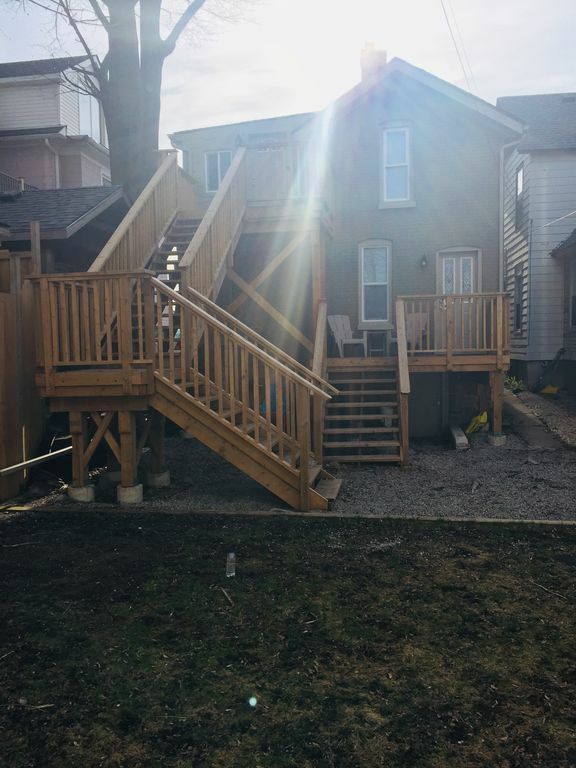 It has a very unique two storey layout with an outside deck on each level, the second storey deck has views of the USA and the Niagara gorge. The apartment has everything you need to be comfortable for a couple days or a couple weeks it has a bbq , Netflix and a washer dryer in the unit. In addition it has two fold out couches making it great for families as it can sleep up to 4 people. The property is located steps from the Niagara River and about a 20 min. Scenic walk to the Falls. It is also conveniently located steps from a WeGo bus stop which shuttle service that goes to the most popular attractions Niagara Falls has to offer. Brian’s house met our expectations as advertised. Great place to stay and enjoy the falls! Nice Place. Great Location. Right Priced. Highly Recommended. This property was recently updated and had everything we needed for a 4-night trip. Brian was a helpful host while also providing tips on the area and local attractions. It was a good location on the edge of downtown Niagara Falls and just a short 20-minute walk to the Canadian Falls. A WEGO bus stop is also very near this property. We would definitely stay here again if traveling to Niagara Falls. The property was exactly as described and the perfect size for the 3 people we had. Brian was a great host who was very helpful on the location and what was around. He was very attentive and helpful anytime we needed him. I would definitely stay here again!